Napoleon defeated two corps of Prince Gebhardt von Blücher’s Army of Silesia at the Battle of Montmirail on 11 February 1814. However, he soon learnt that Prince Karl Philipp zu Schwarzenberg’s Army of Bohemia had taken the offensive in the Seine sector, so prepared to move his army south in order to meet this threat. Blücher, on learning of Schwarzenberg’s actions, guessed correctly that the Napoleon would head south. He therefore ordered his other two corps, commanded by Generals Friedrich Kleist and Petr Kaptsevich, to advance with the intention of threatening Napoleon’s rear. They totalled about 20,000 infantry and 2,000 cavalry. 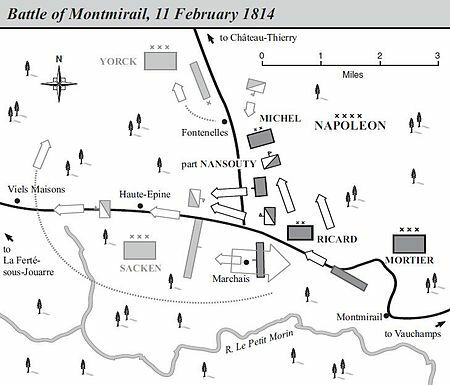 At 10am on 14 February Marmont, who had now been reinforced to 5,000 men, was attacked at Vauchamps, about 4 miles to the east of Montmirail, by Blücher’s advance guard, commanded by General Hans von Zieten. Grouchy’s cavalry then arrived from the north, attacked Zieten’s right flank and routed his division. Click here for a map of the battlefield. Blücher, who had learnt of Napoleon’s presence from a prisoner and seen the fur caps of the Old Guard in the distance, retreated back the way that he had advanced. The Coalition withdrawal was led by Kleist’s corps. Kaptsevich’s corps, accompanied by Blücher, was harried by French infantry and cavalry. At 4:30pm Kleist’s corps was attacked by Grouchy’s cavalry, which had got ahead of them by advancing along a parallel road. The Coalition retreat was slow because their infantry had to remain in squares in order to defend themselves against cavalry attacks in territory described by Dominic Lieven as ‘excellent cavalry country.’ The Prussians and Russians fought bravely, and their discipline held, allowing them to escape, but with heavy casualties. David Chandler and F. Loraine Petre both argue that the Coalition army escaped only because Grouchy’s horse artillery got stuck in the mud. Napoleonic infantry could beat off cavalry if they formed square in time, but were then very vulnerable to artillery. 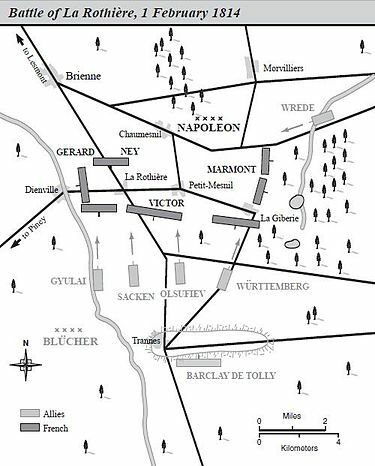 After Blücher had extracted his army from the trap, Napoleon ordered the Imperial Guard and Grouchy’s cavalry to move towards the Seine in order to confront Schwarzenberg. Marmont was ordered to continue the pursuit. The battle cost the Coalition 7,000 men killed, wounded and captured, 16 guns and many wagons. The French lost only 600 men. the second week of February is worthy of Napoleon at his best, and many commentators have compared the tactical brilliance he displayed with the great days of the First Italian Campaign. Napoleon’s movement against Blücher was a brilliant success, but by no means so complete as he hoped for…he had certainly not annihilated [the Army of Silesia]. Marshal Jacques Macdonald’s failure to cut off the Coalition retreat from Montmirail at Château-Thierry and the mud that prevented Grouchy from bringing up his horse artillery against Kleist’s squares at Vauchamps meant that the Army of Silesia survived. Its losses were soon replaced. Troop numbers are from D. Chandler, The Campaigns of Napoleon (London: Weidenfeld & Nicolson, 1966). pp. 970-75 unless otherwise stated. D. C. B. Lieven, Russia against Napoleon: The Battle for Europe, 1807 to 1814 (London: Penguin, 2010), p. 489. Chandler, Campaigns, p. 975; F. L. Petre, Napoleon at Bay 1814 (London: John Lane, The Bodley Head, 1914), pp. 70-71. Petre, Napoleon at Bay 1814, p. 75.